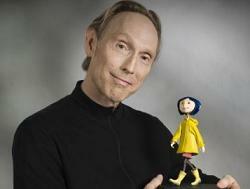 Henry Selick writes and directs Coraline, a breathtaking stop motion animated film based on the book by Neil Gaiman, about Coraline (voice of Dakota Fanning), a young girl who moves into a new house with her mom (voice of Teri Hatcher) and Dad (voice of John Hodgman). She meets a strange kid named Wybie (voice of Robert Bailey, Jr.) along with his black cat. Her neighbor upstairs is Mr.Bobinsky (voice of Ian McShane) while downstairs there's two quirky actresses, Miss Spink (voice of Jennifer Saunders) and Miss Forcible (voice of Dawn French). One day, Coraline finds a door that's actually a portal to another dimension where her Other Mother and Other Father have buttons on their eyes and treat her like a princess. The Other Mother turns evil when Coraline refuses to have buttons sewn onto her own eyes, which would make her stay there forever. Henry Selick has previously directed James and the Giant Peach and The Nightmare Before Christmas. It was a real privilege to interview him. 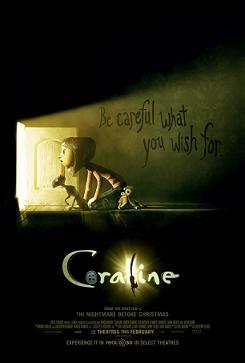 Focus Features releases Coraline nationwide on February 6th, 2009 in 3D and 2D versions. NYC MOVIE GURU: How does it feel being part of the 2nd Golden Age of Animation? HS: It feels great. It’s a good time to be doing this craft. 2D, traditionally-drawn films never really went away. TV shows are still around, but it’s also done as features. John Musker and Ron Clements are doing a 2D animated film for Disney. Wes Anderson is doing The Fantastic Mr. Fox as a stop motion film. NYC MOVIE GURU: What are some of your favorite films from the 1st Golden Age of Animation? HS: There’s a primal power to the very first ones. Even though Snow White isn’t my favorite one, it does have great darkness to the little queen. Pinocchio may be the most beautiful 2D film from that era and also had primal fears about Pinocchio turning into a donkey. And then there’s Bambi with the death of the mother. I’ve always liked scarier things. In Fantasia, [the sequence] “Night of Bald Mountain” is an amazing work of art. I like the more eccentric characters, like Mr.Toad. NYC MOVIE GURU: What important qualities turn an animated film into a classic? HS: It’s something that you want to go back to [watching]. Sometimes, they’re not a classic immediately and it takes a while. Even The Wizard of Oz wasn’t a huge success when it came out. It’s only over time when it was broadcast on TV and grew into this classic film. A certain amount of timelessness [is important along with] archetypical characters, strong, understandable stories, beauty and invention. If there’s too much of an era and there are too many cultural references, it may not date well. NYC MOVIE GURU: How did you find the right balance between entertaining kids and entertaining adults? HS: The history of this film and the book that it’s based on were sort of crossed in cross-hairs of, “Is it too scary for kids?” and “Is it not scary enough for adults?” Actually, that puts it in a great position to be appropriate for both audiences. There’s a just-right place between them and that’s what I was going for. I think it’s what Neil [Gaiman] achieved in his novel, but he did it in a little bit more chilly way where he focused on the Other Mother’s teeth, which were slightly longer. Things were subtly different. In the film, there are a little bit broader strokes. I didn’t want it be too scary for kids. My kids are 10 and 17-years-old. I’ve seen how they responded and learned a lot through them. They like to be scared. The older they get, the bigger the scare and they don’t need as much relief. I do think that animation needs to take more risks in the stories it tells. This is different from animation, but it’s not. The story is a classic, modern fairy tale. It’s Alice in Wonderland meets Hansel and Gretel. It’s a struggle to this very day, even how this film is being marketed for either kids or adults. It’s for both, [though]. NYC MOVIE GURU: How did you feel when you first experienced stop-motion animation? HS: My primal experience with stop-motion was the Ray Harryhausen films of the 50’s and 60’s. I knew that when I saw his creatures and mythological monsters, something in me knew that that thing was real. I didn’t know how big it was or what made it move, but it felt real. It was very different from the Disney cartoons. That remains true. It’s like seeing toys come to life when you wanted them to when you were young. NYC MOVIE GURU: Have you extrapolated stories about any of the other characters besides Coraline? HS: I bet there’s a movie about the Other Mother’s perspective, like the play and the book “Wicked” or like The Wizard of Oz from the witch’s point of view, that makes her a sympathetic character. I don’t know if you can make the Other Mother very sympathetic, but an interesting tale might come from that. Mr.Bobinsky is just someone who stood up on his big, blue legs and, kind of, owned the screen when he was onscreen. He expanded his role in this film just because we loved him and loved watching him move. I don’t know if there’s another film for Wybie, but for a character that wasn’t in the book that was a difficult thing to bring into a classic, I feel happy that he successfully lives in this. I like that other Wybie a lot---the quiet one that can’t talk. There are no characters that I don’t love. You have to love them all to make it work. I think the marriage of the cat with Keith David, the voice actor, is a powerful, wonderful combo. I’d love to have the cat’s perspective [in another film]. He’s a guardian angel, but why is he one? NYC MOVIE GURU: How did you know how far to go with the wacky elements in the film? HS: In the process of storyboarding, that’s where you try out stuff and get to go overboard. At one point, there was a rough relationship between Mr.Bobinsky and Wybie. Wybie had set a bag of dog poop on fire [and left it] at his door on Halloween. At that point, Mr.Bobinsky had potatoes in his pockets and whenever he’d see him, he’d throw a potato at him with great accuracy. When you put it together [with the other scenes], that was too much. The wackiness was not serving the story. NYC MOVIE GURU: Do you think Coraline will learn her lessons about parenting once she becomes a mother? HS: No. When you leave your childhood behind you, you become more like parents. I think, maybe, she’ll be a little warmer than her mom, but she’ll want to be overprotective of her kids, she’ll lock the little door, too, but her daughter or son will want to find the key and go through it. NYC MOVIE GURU: At what point in your life did you know that animation was meant for you? HS: It wasn’t until I was at college and I couldn’t decide. I was in the arts and doing physics classes, but sculpting, photography, drawing, painting and music---I was in bands. Finally, I saw someone’s animated short film and I realized that everything I do is in this movie. It was great [because] I got to combine all of these different interests. NYC MOVIE GURU: Will you ever grow tired of animation? HS: I’ve dabbled in live action and used to draw over at Disney as a 2D animator. I’m only worried about animation becoming tired of me. I’ll never grow tired of it.